Petroglyph attributed to Classic Vernal Style, Fremont archaeological culture, eastern Utah. Rock art is a term in archeology for any man-made markings made on natural stone; most often it refers to markings and paintings on rocks made by Paleolithic and Mesolithic human beings. Rock art can be found across a wide geographical and temporal spread of cultures perhaps to mark territory, to record historical events or stories, or to help enact rituals. Some art seems to depict real events whilst many other examples are apparently entirely abstract. The phenomenon is thought by many to be the foundation of art as well as an indication of the development of cognitive and abstract ability in the evolution of humankind, as most rock art is thousands of years old, created before the advent of the first major civilizations. While we may not understand the purpose for these markings, we can appreciate and enjoy their beauty, admiring the creativity of those from long-ago eras. Traditionally, individual rock markings are called motifs and groups of motifs are known as panels. Sequences of panels are treated as archaeological sites. This method of classifying rock art, however, has become less popular as the structure imposed is unlikely to have had any relevance to the art's creators. Even the word 'art' carries with it many modern prejudices about the purpose of the features. Petroglyphs: Carvings made into stone surfaces, created by rock removal, including scratching, abrading, pecking, carving, drilling, incising and sculpting. Locations of choice are rock facets coated with patina, a dark mineral accumulation on rock surfaces. Petroglyphs remove the patina, exposing the contrasting lighter rock interior. Instances of negative images, produced by removing the patina surrounding the intended figure, are also known. Sometimes petroglyphs are painted or accentuated by polishing. The degree of repatination indicates relative dating. Some of the most ancient petroglyphs are the same color as the surrounding rock. Pictographs: Paintings made on rocks and the inside of caves. Survival of ancient cave paintings is attributable to use of mineral pigments, most commonly manganese, hematite, malachite, gypsum, limonite, clays and various oxides. The best preserved pictography is found under sheltering overhangs and in caves. The simplest pictographs are wet clay finger drawings and charcoal drawings. To produce crayons or paints first the minerals had to be finely ground and combined with binding materials. Crayons and animal hairbrushes have been excavated in caves with paintings. Exceedingly fine lines evidence the production of excellent brushes. The most common rock art element found around the world, the human hand, exemplifies several pictography types. A technique used since the Neolithic is spraying around a hand, resulting in a negative image. The more common positive print was often made with pigment applied to the hand and transferred to the rock. Petroforms: Designs, patterns or primitive sculptures made by the aligning or piling of stones. Petroforms include a rock cairn or inukshuk, an upright monolith slab, a medicine wheel, a fire pit, a desert kite, or simply rocks lined up or stacked for various reasons. Old World petroforms include the Carnac stones and many other megalithic monuments, such as the original settings for Stonehenge and Dolmens found around he world. Petroforms are made from large rocks and boulders, often over large areas of ground, unlike the smaller petroglyphs and pictographs. The meaning of rock art and why it was practiced by many cultures has been discussed without conclusion since scholars first began studying these markings and paintings. The phenomenon has been regarded as the foundation of art as well as an indication of the development of cognitive and abstract thinking ability in humankind, as most rock art is thousands of years old, created before the advent of the first major civilizations. 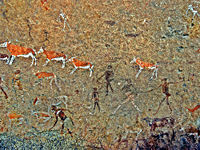 Many pictographs and petroglyphs depict animals, images of nature, and hunting. Some have argued that such images are records of hunts that served not only to inventory the amount of animals killed as well as future references for animal migrating patterns. Others argue that there are religious elements to rock art. Shamanism was the predominate religion when most rock art was created, and so many speculate that in rock art could be the recording of religious practices and beliefs. Common features in rock art that are related to portraying shamans were bones and other skeletal remains on their coats. One reason for the bones would be that they were used as a type of armor for protecting the shaman on his journeys through different worlds. Another interpretation offered is that these skeletal elements are "representations of a shaman brought back to life after the dismemberment that occurs during the initiation process: the depicted bones thus refer to the wearer’s own skeleton." Some petroforms may have been used as astronomical calendars, with rocks aligned to solstice and equinox sunrises and sunsets. They are often found in higher areas, on hills, mounds, ridges, and natural rock formations. Higher ground allowed humans to carefully observe the horizon to mark and measure astronomical events. 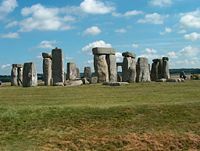 Some rock alignments point out four or more directions, lunar events, the rising and setting of planets, the stars, and other astronomical events. Some petroforms can also be used in more complex ways for astronomical predictions, mapping of the sky and ground, and for complex ceremonies that help to memorize many oral stories. Petroforms are similar in some ways to medicine wheels which are also aligned with sunrises and sunsets, equinoxes, solstices, lunar events, and star patterns. Petroforms also mirrored the night sky, and the patterns of the stars, similar to astrological signs and symbols. The Sioux have oral stories of the serpent in the sky, a turtle, a bear, and other patterns seen in the stars. What is often known today as Orion's belt was one prominent star formation, along with the central and stationary North Star, now named Polaris. Other interpretations include geographic markers, hunting aids and, in the case of dolmens, burial structures. Petroglyphs are easily accessible from the Una Vida site, Chaco Culture National Historical Park, New Mexico. Indigenous Australian rock painting in Kakadu National Park. Pictograph, southeastern Utah, attributed to Basketmaker period, Puebloan archaeological culture. ↑ Patricia A. Kurtz. "As It Is Above, So It Is Below." Native Peoples Magazine "Petroforms" Retrieved January 3, 2008. ↑ Kathy Roetzel, "Rock Art: Dating" (2000). Retrieved January 3, 2008. ↑ Ekaterina Devlet, "Rock Art and the Material Culture of Siberian and Central Asian Shamanism" The Archaeology of Shamanism. 2001, 43-54. 01/04/2007. Retrieved January 3, 2008. ↑ Chris Scarre, Megalithic Monuments of Britain and Ireland, (Thames & Hudson 2007. ISBN 0500286663). All links retrieved June 4, 2014. Rock art and petroglphs A rock art site, mainly devoted to Valcamonica and Alpine Rock Art. This page was last modified on 15 July 2015, at 16:35.